RR win by seven wickets! Tripathi slams a six over mid-wicket and RR have won the match by seven wickets. Their first win of the season. RCB's fourth consecutive loss. OUT! Smith departs! RCB finally take a catch. Umesh Yadav holds onto the drive to long-on. Smith c U Yadav b Siraj 38(31). RR: 154/3. OUT! Chahal removes Buttler! There was no need for the big shot but Buttler decided to step out against Chahal's slow, tossed up ball. Failed to get the connect as Stoinis took the catch. Buttler c Stoinis b Chahal 59(43). RCB: 104/2. FOUR! FIFTY! Buttler steps out against Mo Ali to smoke him down the ground. Fourth consecutive fifty at Jaipur. WICKET! Chahal strikes to remove Rahane! The googly does the job for the leggie. Rahane was looking to make room but the ball came in to hit his pads. RCB need a few more quick wickets to make a comeback. Rahane lbw b Chahal 22(20). RCB: 60/1. OUT! Parthiv Patel holes out in the deep. Archer picks his first wicket. Was the slower delivery, back of the hand, from Archer and Parthiv looked to club this over long on, did not get enough as Rahane snaffles the catch in the deep. Parthiv has done his bit, over to Stoinis and Co to see RCB through. Fine innings comes to an end. OUT! Another googly and another wicket for Gopal. He is on a roll here. Hetmyer's woes in the IPL continues. Was looking to push it through covers off the backfoot, but doesn't cover for the turn, gets the outside edge and Buttler pouches it. More trouble for RCB. OUT! Shreyas Gopal has another big fish. AB de Villiers has to walk back. RCB crumbling once again? Another wrong 'un, and AB has struggled to get his timing right on the previous couple of deliveries was looking work this ball to wide mid on, get a leading edge that bobs back to Gopal, who takes a good low catch. Lack of pace on that occassion as well. OUT! GONE! Virat Kohli has been bowled through the gate! Shreyas Gopal has struck off his second ball. It was the googly and the Indian captain has been beaten neck and crop. Not many can do that, but here he Gopal has. Kohli's dismissal is reminiscent of how Mujeeb Ur Rahman bowled him during last year's IPL. Kohli didn't read the wrong'un, went for the drive through the covers and the ball sneaked through to rattle the stumps. 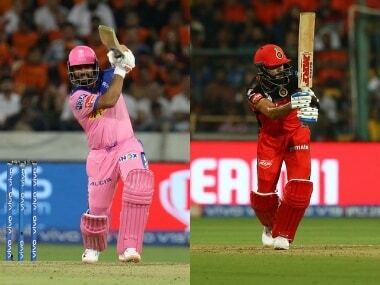 Toss: Virat Kohli calls heads but it is a tail and Ajinkya Rahane says Rajasthan Royals will be fielding. That's for today! RR collect first points of the season with a win over RCB, who remain winless. We have a big one coming up tomorrow — Mumbai vs Chennai. Hope you enjoyed the coverage of today's match. We will see you tomorrow. Goodbye and good night! Shreyas Gopal: I am fortunate and lucky to have gotten those big wickets, again I'm saying it as a youngster getting such big names out doesn't come everyday. I was just fortunate, and the plans worked. Coming in to bowl in the seveth over, we had built a lot of pressure in the Powerplay. I had come in after that, and because the batsmen were trying to score off me, I managed to get the wickets. Pretty comfortable bowling my variations, I rely on my gut feet while deciding what to bowl. I really don't know why wristspinners do so well in T20s. But maybe it's because we can spin the ball both ways. Overall, it's about bowling in good areas and being disciplined. Ajinkya Rahane, RR captain: Thinking was dew factor, so we though to restrict them to around 140-150 would be a good total. Shreyas Gopal's record against Virat and de Villiers we all know, but overall it was great team effort. After three-four overs we thought the wicket was really slow, so I thought if spinners bowl well then batsmen will have a hard time. Gowtham was excellent in the Powerplay, and Gopal backed up after that. Relief, yes, to get points on the board. We played good cricket last three games, but tonight it was all about giving more than 100%. Tripathi was really struggling before the match he twisted his ankle last game but he was incredible with Stokesy and Smith. Virat Kohli, losing captain: Today, it was a more competitive performance. We were short by 15-20 runs but I think Parthiv and Stoinis took us to a competitive total. We put down few chances, if you don't take your chances you can't win games. We have 10 games to do, hopefully we can turn things around. We played well in Mumbai game and in this game. This tournament is not that long and you have to think on your feet and have to think about the best combination going forward. We should focus on putting our best eleven on the field. Smith departs for 38 as his drive to long-on is taken by Umesh after RCB drops two catches. First of Smith at short mid-wicket by Negi and then Tripathi's pull shot put down by Mo Ali at square leg. Five in six needed. DROPPED! Smith put down at short mid-wicket by Negi. Tough chance! Smith went for a pull, didn't get the connect but still it was far from the fielder who put in a good effort. Nine off the over and nine more required in last two overs. Tripathi gets a four as he whips the full toss from Saini through backward point. RR had enough and they now want to take control of things. Tripathi slams the outside off delivery over extra-cover for a four and Smith finishes the over with a strong swing of the bat off slower from Siraj for a six. 16 added. 18 in 18 required. SIX! Smith hoicks the slow delivery from outside off from Siraj over mid-wicket. Maximum! FOUR! Outside off, fuller length ball dispatched over extra-cover by Tripathi. That should help release some pressure. Chahal's excellent bowling for the night comes to an end at 17/2. Could have been three wickets for the leggie but Umesh dropped a sitter of Smith at deep cover. Smith went inside-out against the loopy delivery, drove it in air but Umesh put down the catch. Tripathi also gave some hope but his straight drive fell just short of bowler Chahal. 34 required in last four overs. Stoinis has been guilty of bowling short on too many occasions. Went short again as Tripathi slammed it to mid-wicket fence. Another shorter one is pulled for a double by Smith. Four singles added as well. RR need 38 in last 5 overs. Smith opens the face of the bat late against length ball outside off by Umesh to guide it through to third-man fence. Seven off the over. Chahal strikes to remove Buttler! Can RCB make a comeback? If they do Buttler has to be blamed. With everything in control went for a big shot against loopy Chahal delivery, failed to connect properly as Stoinis took the catch in deep. Another stumping appeal against Smith but he's safe. 55 needed in last seven overs. FIFTY for Buttler! 100 up for RR! Buttler shimmies down to clobber Mo Ali down the ground to complete his fourth straight fifty at Jaipur. Ali goes shot after that as Buttler whip-pulls it over mid-wicket. 14 off the over. This is Jos Buttler's fourth consecutive T20 fifty at Jaipur in IPL. Smith gets lucky as the inside-edge off Stoinis runs down to fine leg fence. The slow pace did the trick as Smith went for a pull from outside off but the inside-edge missed the legstump. Seven off the over. Eight off the over including a wide including a double for Buttler courtesy a misfield from Umesh. Chahal was super angry, outfoxed Buttler who somehow managed it to guide it to point but Umesh failed to get down in time to stop it as a fumble led to two runs. Stoinis called into attack. RCB need spinners and not pacers as the Australian concedes 11 in his first over. Two boundaries off two short balls. He can't bowl short at his slow pace. First was pulled to leg while the other was slapped to long-on. Kohli finally decides to go to his spinner and Chahal draws the first blood with a googly against Rahane. The skipper was looking to make some room for a shot on off but the ball spun back in and crashed into his pads, out LBW. Two off the over and Smith joins Buttler. Ajinkya Rahane averages 11.50 against Chahal in IPL (2 dismissals). Excellent start for RR. 104 more needed in 14 overs. Rahane slams two fours in the over. Brings out the helicopter-flick to get a four through mid-wicket and then a lovely uppish drive over extra-cover. Nine off the over and RR have got 55 in the powerplay. Siraj called into attack and takes control of things in his first over. Five dot balls to Rahane as he takes a single on the last ball with a push to mid-on. 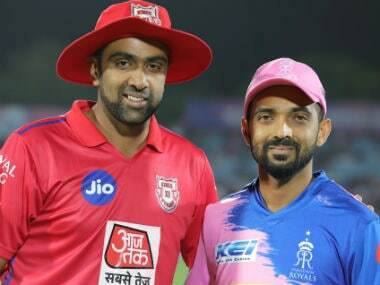 IPL 12 Match 14 RR vs RCB at the Sawai Mansingh Stadium in Jaipur: Tripathi slams a six over mid-wicket and RR have won the match by seven wickets. Their first win of the season. RCB's fourth consecutive loss. 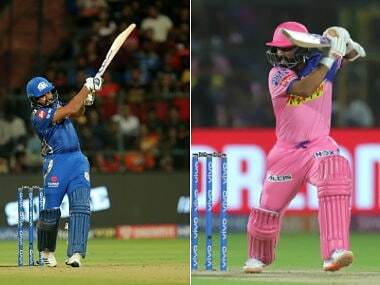 IPL 2019, RR vs RCB, Today's Match Preview: In a battle of the 'Royals', both – the Rajasthan franchise and the Challengers from Bangalore – will be searching for their first win of the Indian Premier League (IPL) 2019 when they meet at the Sawai Mansingh Stadium on Tuesday. After having lost their first three games, both sides will be eager to get first points on the board to kick-start their campaign, with the tournament already in its second week and the competition moving fast. Hosts Rajasthan Royals are expected to miss out on services of three of their key players at the start of May as Jos Buttler, Ben Stokes and in all likelihood Jofra Archer will return to England to prepare for the World Cup. Rajasthan will be hoping overseas stars Australia's Steve Smith and all-rounder Stokes to finally hit their straps against RCB. Their costly purchase Jaydev Undakat has failed to meet expectations so far and he could be dropped in place of Mahipal Lomror or Varun Aaron. Rajasthan have squandered matches from winning positions and the Ajinkya Rahane-led team has found themselves on the wrong side of couple of close contests so he would hope to find the finishing touch against Virat Kohli-led side. "We win as a team and we lose as a team. If we win the smaller moments in T20s we will do well. We have played well in the last three games and hopefully, with some luck, we'll be able to turn it around," said Rahane after the loss against Chennai Super Kings. 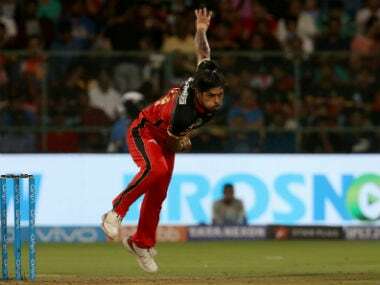 While RCB have been outplayed completely in two out of their three games having been shot out for 70 in the tournament opener against CSK and two nights ago suffered an 118-run drubbing against Sunrisers Hyderabad. "We just need our players to put up a better challenge up front. There are still 11 games to go. The pitch will be nice in Jaipur against the Royals. We need to bring our A game, like we did against Mumbai and play with that kind of intensity," said Kohli after RCB's third loss in a row. Both teams will once again pin hopes on the foreign stars like Steve Smith and Ben Stokes for Rajasthan and AB de Villiers from RCB to hit their straps. 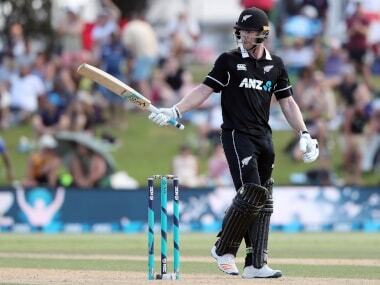 Few changes could be expected as well with likes of Tim Southee and Heinrich Klaasen might get a look in place of struggling Kiwi all-rounder Colin de Grandhomme and Windies batsman Shimron Hetmyer. Royal Challengers Bangalore Team 2019 Players list: Virat Kohli, Parthiv Patel, Moeen Ali, AB de Villiers, Shimron Hetmyer, Shivam Dube, Colin de Grandhomme, Umesh Yadav, Yuzvendra Chahal, Mohammed Siraj, Navdeep Saini, Devdutt Padikkal, Himmat Singh, Milind Kumar, Gurkeerat Singh Mann, Heinrich Klaasen, Pawan Negi, Washington Sundar, Akshdeep Nath, Prayas Barman, Kulwant Khejroliya, Tim Southee.